So, this spider walks into a bar… Oh wait! That’s not a spider missing six of its legs, that’s Sir Pinkerton Xyloma’s mustache! 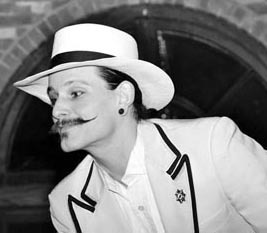 Ever since I met up with Sir Pinkerton Xyloma, the central organizer and host of Milwaukee’s original and unique Dead Man’s Carnival, his handlebar mustache, twirled to the finest of points, resting whimsically upon his upper lip, has taken on a life of its own. It has turned into a spider, the Spider of magic and myth. The Spider-Creator of Native American cosmologies is a descriptor for this magician who is a creative tour de force, weaving scenarios that push and surprise the senses. “When we first started the show [in 2007], it was a group of veteran street performers who wanted to do something that was a little bigger, a little more grand,” he explains. His lifeblood, it seems, is creativity. Besides hosting, Sir Pinkerton sometimes displays his own various magical skills and leads the masterful, eclectic, six-piece band. It is the art of weaving the present moment: The music with the performing act. The audience into the show. This is the West African Spider-Trickster aspect of Sir Pinkerton Xyloma crushing altars of homogeneity and lassitude underfoot with a wink and a drumroll. Says a.k.a Professor Pinkerton, “A lot of the message you’re going to hear in ours, or any traditional vaudeville show, is very cynical of the status quo. It has a sort of radical edginess to it intrinsically. “The early vaudeville stage (was) one of the first safe havens for women performers, homosexuals, even breaking down racial lines.” It is said of Anansi/Spider-Trickster that he could turn the table on his powerful oppressors using his cunning, and a few tricks. Having trouble getting a full picture of what a Dead Man’s Carnival show is like? I recommend you experience it in the flesh. Seating begins at 8PM at their home base, the Miramar Theatre, every first Friday of the month (almost). “Our monthly show is kind of our focus. It’s our pet project. We put the extra effort in. It’s always the biggest, wildest of the shows that we do,” says Sir Pinkerton. If you miss October’s show, Dead Man’s Carnival’s season finale will happen on November 1 at the Hotel Astor Ballroom. Or look for them at various events around town, or Minneapolis, Detroit, St. Louis, maybe Brazil in the future. This long-time Riverwester has siblings in the latter and wouldn’t consider a visit without bringing along the troupe. For many Native Americans to this day, it is considered bad luck to kill a spider.